Beloved the world over for its sweet, tropical taste, papaya also offers big nutritional and medicinal value. Read on to learn more about this fruit. Hailing from Central America, it is thought that the first papaya trees come specifically from southern Mexico, as the plant was cultivated in that region even before the emergence of prominent Mesoamerican civilizations like the Aztecs. The fruit was first discovered by Spanish and Portuguese settlers in the 14th century, and it was later introduced to Southeastern Asia and parts of Africa. Promoting digestion. Papaya contains an enzyme called papain, which helps digestion. Improving cardiovascular health. Papaya as a whole improve cardiovascular system, reducing cholesterol and protecting against heart diseases, heart attacks, and strokes. 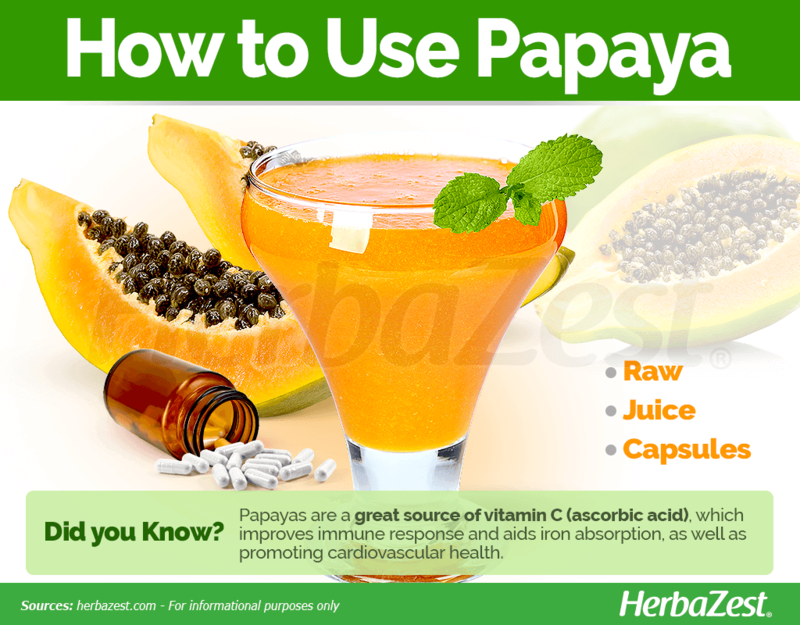 Papaya has also been traditionally used for treating stomach worms, as well as relieving fever and malaria. On the nutritional side, papaya has shown to be a great source of vitamins A (retinol), B9 (folic acid), C (ascorbic acid), and E; minerals, such as calcium, magnesium, and potassium; and dietary fiber. The most remarkable nutrient contained in pulp and seeds of papaya fruit is papain, an enzyme that aids in the digestion of protein. It works by cleaving proteins at the bonds between certain amino acids, making meat softer and easier to digest overall. It is thought that papain also prevents clots by helping to break down certain antibodies. Papaya is also an excellent source of antioxidants, such as beta carotene, a precursor of vitamin A, and vitamin C (ascorbic acid) that prevents the cellular damage caused by free radicals and promote cardiovascular health. It also low cholesterol levels, due to its dietary fiber content. 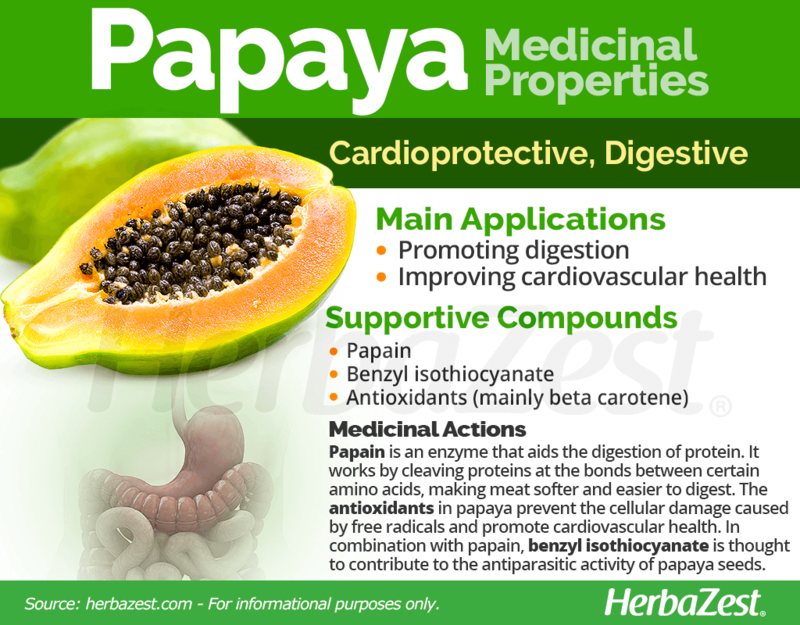 Additionally, both papain and benzyl isothiocyanate are thought to contribute to papaya seeds anthelmintic activity. Apple and psyllium also possess digestive properties, and similar cardioprotective benefits can be found in herbs like avocado and sacha inchi. Ripe papaya fruit is generally regarded as safe, though consumption of extremely large quantities can result in a harmless and temporary yellowish-orange coloration of the skin. Unripe papaya fruit has a latex on the surface that may cause skin irritation and other allergic reactions on contact. Preliminary studies have found that, although ripe papaya fruit had no toxicity, unripe and semi-ripe preparations may cause contractions, possibly leading to miscarriage. 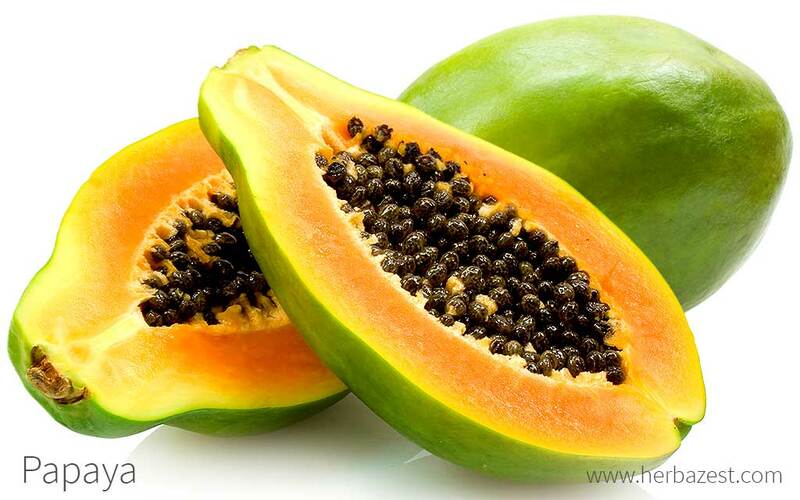 It is recommended that pregnant women avoid unripe papaya and papaya seeds. In spite of not being considered as a citric fruit, the nutritional value of papaya includes great amounts of vitamin C (ascorbic acid) which, in combination with other antioxidant compounds in the fruit, improve immunity, aid iron absorption, and promote cardiovascular health. Papayas also provide adequate amounts of vitamin A (as beta carotene), vitamin B9 (folate), copper and magnesium, as well as small quantities of B complex vitamins, choline, vitamin E (alpha-tocopherol), vitamin K (phylloquinone), calcium, manganese, and potassium. 100 grams of papaya provide 43 calories and 7% of the daily value for fiber. 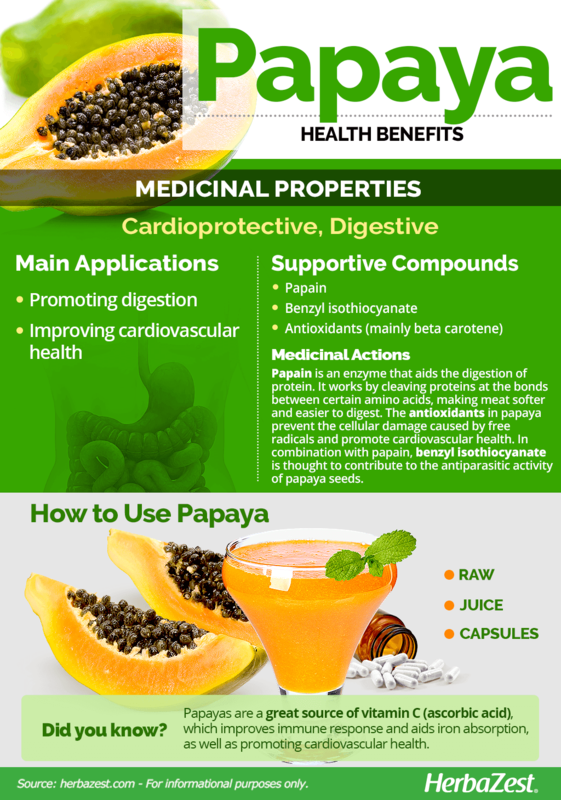 While consuming papaya as a snack or in juices is a great way to obtain its health benefits, supplements can be equally effective in relieving digestive discomfort, as well as a good option for those who dislike papaya taste. Raw. Papaya fruit can be eaten as a snack and as a part of a fruit salad. This way of consumption is great to collect its nutritional benefits, as well as to enjoy its sweet, mild flavor. Juiced.Papaya can also be consumed as a juice or in smoothies, alone or in combination with other fruits, as a way of supplementing vitamin C and dietary fiber. Papaya capsules. Papaya enzymes are present in this form. However, concentrations may vary depending on the commercial brand. They also come in chewable form. Thanks to a globalized world, papaya can be found year-round in most grocery stores and supermarkets. The fruit is ripe if the outer skin gives a little under gentle squeezing, similar to an avocado. Although occasionally called green papaya, it may be red or yellow as well. Red papaya is the most readily available, though in the U.S., most papayas are versions from Hawaii. As they steadily grow in popularity, papaya enzyme supplements are becoming more readily available each year in health food stores and wholesale retailers. Online retailers provide the widest variety of papaya supplements. Tablet form is certainly the most common, and most suggest that they be taken directly after meals to offer best results. Cultivation of papaya trees is limited to tropical regions because of the plant's requirements and susceptibility to low temperatures. Papaya prefers a temperature range from 70 – 90°F (21 – 32°C), and fruit production suffers at anything lower than 60°F (16°C). The plant is quick to grow and flower, sprouting after 10 - 14 days and fruiting within three years. 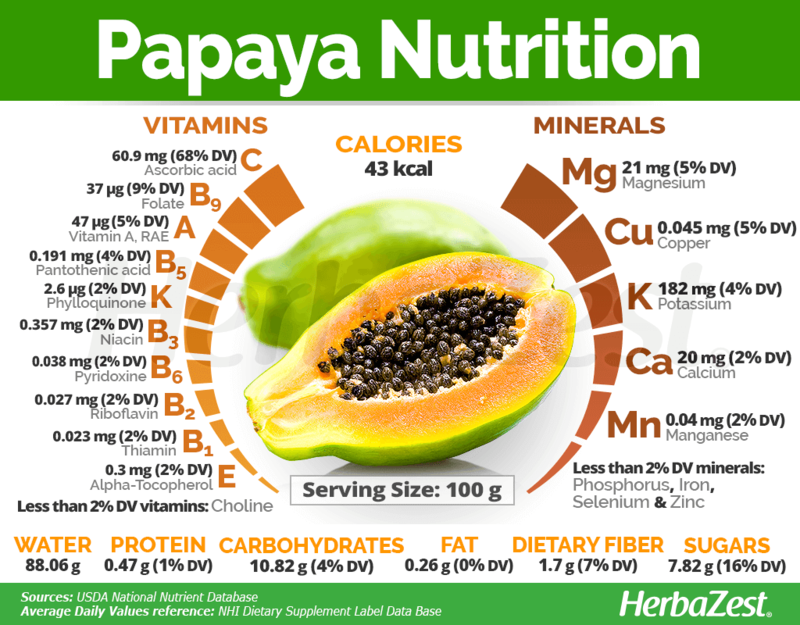 Papaya grows best in light, porous soils rich in organic matter, with an ideal pH of 5.5 - 6.7. However, it can tolerate slightly acidic soil. Papayas are generally grown from seed, but they can also be propagated by cuttings. The plant needs plentiful rainfall or irrigation but must have good drainage. Papayas grow stronger and are more fruitful with a spacing of six feet (1.8 m). More detailed information about growing papaya can be found in the herb garden section. Papaya is a short-lived, fast-growing, woody, herb-like tufted tree that can grow up to 33 feet (10 m) tall and has regular, spiraling foliage. Its flowers are white, and fruit normally sprouts from lower on the trunk, as it is uncommon for it to have many branches. The color inside each fruit can vary depending on the part of the world to which the tree has adapted, ranging from yellow to a deeper red. There are two main varieties of papaya, and they get their names from the color of the flesh of the fruit. Though common throughout the world, red papaya is more commonly sold in Western markets and is quite sweet in flavor, while yellow papaya is slightly bitterer and found in certain Asian countries. Disease-resistant papaya cultivars, including 'SunUp' and 'Rainbow', are now the norm in Hawaii, in response to the papaya ringspot virus. Papaya is commercially cultivated in 54 countries. However, the major producer of papaya has been consistently Brazil, followed by Nigeria and India. The top ten rank of producers also includes Mexico, Indonesia, Ethiopia, Congo, Peru, Colombia, and Philippines. However, all ten countries contribute with more than 71% of the total world production. The latest UN records for worldwide papaya production weighted in at 11.6 million tons in 2011. On the other hand, the major exporters of papaya are Mexico, Malaysia, and Brazil. Purdue University, Papaya Carica papaya L.